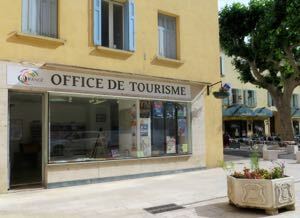 The Tourist Information Office in Orange, France, is in transition as of 2015. Formerly housed in a cute small building, bedecked with flowers, on the busy Cours Aristide Briand (still the official address), it is now open temporarily in a small building on the Place des Frères Mounet, just across the street from the Antique theater. Inquiries at the office were only able to ascertain that for now, the Tourist Office is in the Frères Mounet location. Work is underway to build a new Tourist Office on the Cours Aristide Briand, but it is not clear when/whether that might open. If you're driving into Orange, you'll find parking near the Cours Aristide Briand, and you can easily continue on foot from there. The current Tourist Office is only about a five-minute walk from that parking; follow signs to the Antique Theater, and look for it across the street, next to a large area of restaurants. Above, Temporary Tourist Office at the Place des Frères Mounet, Orange.